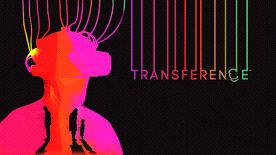 Transference™ is a psychological thriller and the first game collaboration between SpectreVision and Ubisoft. Character-driven stories tackling emotional and human experiences that challenge conventions, combined with the experience of building rich gameplay. Come face to face with a fractured family as you freely explore their minds. Navigate a dream-like home filled with secrets. Collect the evidence of a family’s history to choose how you repair their lives. Affect their lives from the unique perspectives of each family member to piece together the mystery. The choices you make from every angle ripple through time and space, as you learn their story.